First I had Birdphoto.se together with two friends, Robert Paepke and Niklas Nilsson, but now since December 2007 its my personal site with just my pictures. The old gallery can be viewed under this link until further notice. Both Niklas and Robert has plans of creating their own sites and of course you will find info about it here. Under "Links" in the meny I've collected some of my other friends sites and there you will also find links to other good naturephotographers and other sites that I find useful. 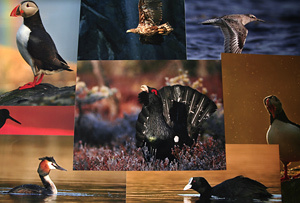 The new Birdphoto.se was created 2007 and is best viewed in a screen resolution higher than 1024 x 768 pix. Most of my pictures here on the site are available for magazines, websites etc. But you are not allowed to use them without my permission, please send my an e-mail if you are interested. I sell paperprints up to A3-size (30 x 40 cm) and Canvasprints from A3 up to at least 1,5 x 1m. The prints are from a local photo-store and framing can be arranged if requested. Please contact me for further information and prices.